Chattogram City Corporation (CCC) has taken a special ‘crash programme’ to reduce the long-drawn water logging problem in the upcoming rainy season in the port city. 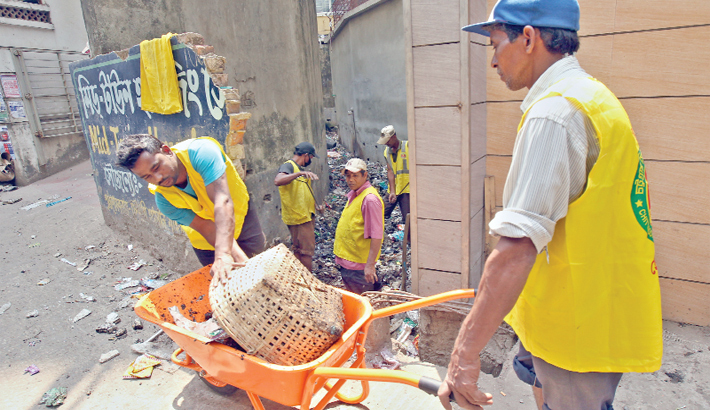 Sources said activities of the month-long crash programme have already been started through removing soils, sands and garbage by conservancy workers of the CCC from drains in Khalifapatti area under Dewan Bazar ward on Monday. CCC Mayor AJM Nasir Uddin inaugurated the programme in presence of local ward councillors and officials of the CCC. While inaugurating the programme, Mayor Nasir said they will hold a tripartite meeting with Chattogram Development Authority (CDA) and Bangladesh Army, which has been working with the CDA for implementing a mega project to address the waterlogging, regarding the problem within this week. Sources in Conservancy department of the CCC said there are some 856 kilometre (Km) concreted drains with an average width of 6.89-feet under 41 wards of the CCC. Besides, there are some 16-Km mud drains of 4.6-feet width and 2,800-Km drains of less than 3-feet width. Sources said CCC will only remove soils, sands and garbage from the drains having less than 3-feet width. On the other hand, the CDA is the responsible to clean rest of the drains having over 3-feet width, they said. So, the CDA will have to clean some 900-Km drains before the rainy season along with the ongoing works of the mega project taken to address the waterlogging. The crash programme will be conducted at Dewan Bazar, Jamal Khan, Anderkilla, Uttar and Dakkhin Patenga wards from March 11 to March 14, Paschim Sholoshahar, Shulokbahar, Bagmoniram, Uttar Agrabad and Dakkhin Halishahar wards from March 15 to March 18, Paschim Bakolia, Dakkin Bakolia, Gosaildanga, Halishahar Munirnagar and Dakkhin Madhyam Halishahar wards from March 19 to March 22. Besides, the works for removing soils, sands and garbage from the drains will remain continued at Chandgaon, Lalkhan Bazar, Chawk Bazar, Uttar Halishahar and Alkaran wards from March 23 to March 26, Uttar Kattali, Dakkin Kattali, Pahartali, Enayet Bazar and Boxirhat wards from March 27 to March 30, Uttar Pahartali, Uttar Pathantali, Rampur, Dakkin Agrabad and Patharghata wards from March 31 to April 3, Panchlaish, Mohora, Purbo Sholoshahar, Saraipara and Firingee Bazar wards from April 4 to April 7, Dakkin Pahartali, Jalalabad, Purbo Bakolia, Pathantuli, and Purbo and Paschim Modarrbari wards from April 8 to April 11. Sources said the city dwellers have been experiencing immense suffering due to waterlogging over the last few years. People of the city’s low-lying areas remain marooned due to the waterlogging in the rainy season. The drains get filled with soils and sands due to land and hill erosion interrupting smooth flow of water through the drains, they said. Contacted, CCC Chief Conservancy Officer (CCO) Sheikh Shafiqul Mannan Siddiqi told the daily sun that they have already started the month-long crash programme with a view to reducing the waterlogging from the city’s Khalifapatti area on Monday. He said they divided the 41 wards into different parts to carry out the crash programme smoothly. A total of 50 workers will work for removing soil and garbage from the drains for four days at a ward, he said adding that some 115 tonnes of soils and garbage were removed on the first day of the programme. CDA Chief Engineer Kazi Hasan Bin Shams said that soils and garbage will be removed from the drains before the rainy season under the mega project taken to address the waterlogging. Process for assigning contractor for carrying out the works is now going on, he said. Mentionable, the CCC also took a project titled ‘Project to address waterlogging and develop environment in the CCC area to prevent impact of climate change’ to check land erosion and hill-slide in the hilly areas of the city last year. Besides, the Executive Committee of the National Economic Council (ECNEC) approved the mega project of CDA on August 9 in 2017. CDA and Bangladesh Army signed a memorandum of understanding for carrying out works under the mega project ‘Canal re-excavation, expansion, renovation and development for addressing the waterlogging in the Chattogram city’ involving Tk 5,616 crore on April 9 last year. The CDA in cooperation with the Army started the works formally on April 28 of the same year. According to the CDA, some 528,214 cubic-metre soil and 420,000 cubic-metre mud will be dredged from 36 canals under the project. Three water-bodies will be dug, 10.77 kilometre side drains, 176,000 metre retaining wall, 85 km road and 48 PC girder bridges will be constructed to address waterlogging.